Wondering how to finally be happy in your marriage? I spent the majority of Saturday and half of Sunday lying in bed, enduring a migraine headache – it’s been well over a decade since I’ve had one, so at first I wasn’t even sure what was going on. If you haven’t had a migraine, I assure you, it’s an event worth missing. I can’t explain this, but my hair follicles also hurt. And today I have a “migraine hangover…” BLEH. And in the midst of my complaining, His Spirit gently reminded me I had much to be thankful for, and I decided to obey and be grateful – for the pain. I actively chose to thank God for the pain – and for a chance to let others do for me, and for the quiet house, and for the chance to actually spend a weekend RESTING. When I looked at Dare 9 for today, I noticed it tied right in! In the past, I might have behaved like a doormat, however, insisting I could still function instead of taking a much-needed rest and letting others pitch in. I’ve learned, however, that it’s really not honoring God to fry myself in an effort to serve others. It’s also not honoring God to LIE – especially when everyone around you can plainly see the truth. It’s not being selfish to sometimes say, “I can’t do this,” when we’re sick, tired, or otherwise committed. We literally steal opportunities for others to grow and learn to serve when we do. My husband is a much better and more creative cook than I am any day, so it’s great when he takes over! In the midst of that, I’ve also lied to the people around me by saying, “I’m fine,” while I was honestly NOT. And if you are living with teenagers, you know their emotions swing high from one extreme to another, so it is really a waste of time to get exercise by jumping to conclusions! Give them five minutes – they’ll feel something else entirely! I really liked how the woman in Dare 9 dealt with her step-son! 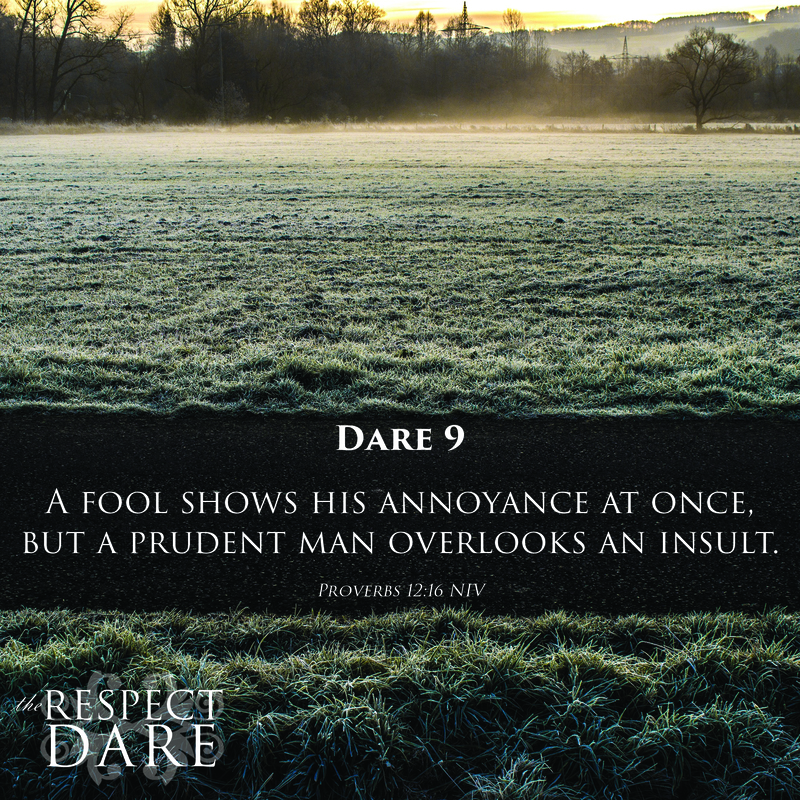 So today’s dare is to OVERLOOK an insult – and contrast that to showing annoyance quickly. Do you get upset quickly and easily? Do you immediately see what is WRONG and give voice to THAT? Or are you working on seeing life through the lens of the Holy Spirit, paying attention to whatever is good, noble, right, pure, admirable, praiseworthy, excellent, etc.? It’s painful to be around people who are negative. The complaining is contagious and it is bad for others and bad for us. Here’s a great article on the research about how complaining is damaging to both our own and other people’s health. It’s good for your soul to find ways to be grateful – that’s why the “Gratitudes” exercises are in everything we do at Greater Impact. Not only is the concept hugely talked about in the Bible, but now there’s research supporting it. And we can finally be happy in our marriage if we start paying attention to the right things – AND stop lying to ourselves and others. Here’s WHY: Sin (complaint & lying) and a lack of gratitude (probably also sin) SQUELCH the Voice of the Holy Spirit. We lose His peace and His presence and can’t hear His next orders. . . . . Thank you Nina, that is truly stinging and enough to work on for the duration. 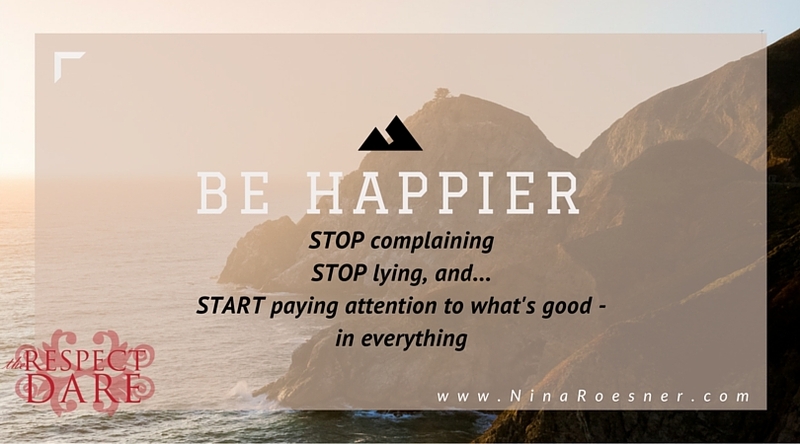 I made that my new screen saver: STOP complaining, STOP lying, and START paying attention to what’s good – in everything. . . .Thank you for teaching the hard stuff. –Wow, that is as real/authentic as a sawed-off shotgun blast at close range. HARD honesty and that is depressing too. . . . And yet, depression is the inability to trust Jesus for a future. . . . I am praying you get better (re: migraines, et.al.) and STAY better. . . . I don’t think I would be able to take what truths would come out of you if new tragedies were to befall you. Any good is all God, baby! I know you know! This is good stuff Nina, and also timely for me as I am sick right now, have been sick all weekend with the flu. I feel pretty awful. Yesterday, I did something I normally don’t do, and I asked my husband to help me make supper. (I can’t really ask him to make it on his own, because he really doesn’t know what to do on his own at this point.) He did help – and I felt happy instead of resentful. I can’t believe all this time I could have been asking for help, but didn’t. Interesting that you put “Don’t lie” as one of your points, because it sounds harsh but it’s perfectly valid. I often did lie in the past when someone asked me “how are you?” because I didn’t want to make the other person feel obligated to do anything for me. I never thought of it as lying, but I guess it is, isn’t it? I do have one question though – what do you mean by complaining in this context? Because sometimes you’ve gotta complain if you’re going to be honest. If my husband asks me “how was your day?” and it was a horrible day, the kids have been squabbling and I feel sick, I can’t answer without complaining, right? If I say my day was fine and think of something pleasant to point out about it, isn’t that lying? I guess you must been not going on an on about it, right? Jeanne! I’m so sorry you are under the weather!! Flu is awful. I hope you are well soon. Praying His healing for you! And then there’s the constant dripping of a contentious woman from Proverbs – I think she’s mentioned about 5 times… which means she was a CONSTANT complainer and arguer. So telling the truth and lying fit into those contexts. When asked, we speak truth. When need is necessary to communicate, we speak truth. Got opinions? If it’s not in response to someone’s question or we have a need to fill, we should keep our judgment to ourselves – often our “truth” is really criticism of others, which is judgment, and not our place. Thanks for the opportunity to clarify!! 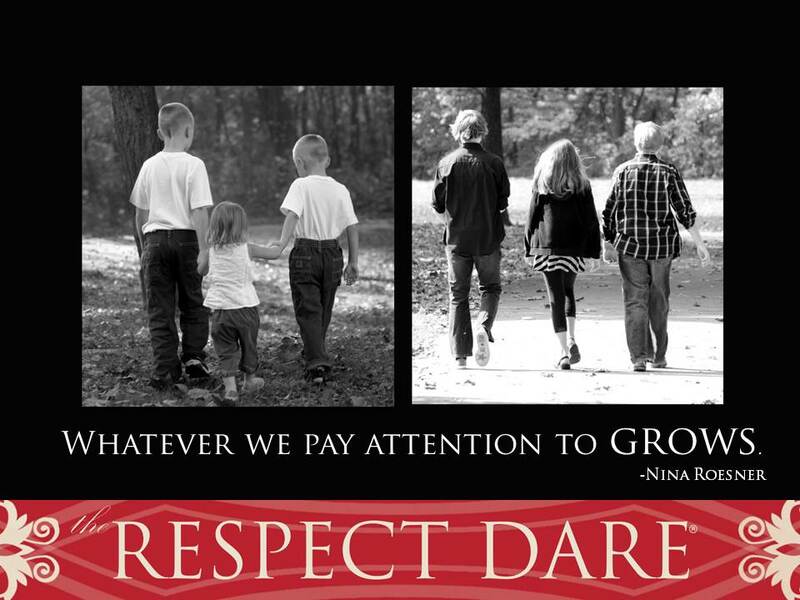 Great post Nina! Your comments about being hypersensitive when not feeling well resonated with me. Just to add one more dynamic to that mix, it’s really easy to start LOOKING for ways others might insult you – or even SEARCHING for fault in others. Our feeling poorly shouldn’t mean others have to as well! Blessings! Excellent point, Kyle! 🙂 And for what it’s worth – we’re all just THRILLED you are up and around again! 🙂 You certainly would know!